Nobody can deny that the foreign sector has become the driving force behind the Spanish economy at present and will be the stronghold of the recovery in the coming years. Indeed, without its contribution the fall in GDP would be around 4%, in contrast to the decrease in growth that the external accounts generated in the 2005-08 period (with negative contributions close to 2% in any year). This is not an isolated case of Spanish economic history. The foreign sector has enabled us to overcome previous crises. However, unlike in the past, where currency devaluation was a crucial competitive gain, now it has to be rooted in other factors, at both macro- and micro-economic levels. In fact, as a result of the difficult reforms that are being carried out, we can already observe macroeconomic competitiveness gains in unit labour costs (owing to improvements in costs and productivity, the latter in part due to falling employment levels) and our effective exchange rate in real terms (i.e., the ratio of our currency and our prices with currencies and prices of our trading partners, weighing each partner according to their relative weight in our exchanges). However, the aim of this article is not to analyse competitiveness from a macroeconomic point of view, but from a microeconomic perspective, that is, from the point of view of the company and, in particular, the internationalisation process. To this end, this article will discuss the latest state of affairs of the Spanish foreign sector, through a SWOT analysis, the relationship between competitiveness and internationalisation from the perspective of the company and the strategic decisions that these companies have to make in their internationalisation process, so that it is successful. strengths and weaknesses and the threats and opportunities arising from the global environment. The weaknesses of the Spanish foreign sector include the following. Despite recent improvements, Spain still has an export base lower than neighbouring countries. Of the 123,000 companies that exported in 2011, only 37,250 were deemed regular exporters. Medium-sized Spanish SMEs have serious problems compared to their european counterparts, size being a key variable in productivity. Around 67% of Spanish exports in 2011 went to the eU. It is obvious that the area is a comfort zone for Spanish companies but, in saying that, europe was the region most affected by the global economic downturn. According to OECD estimates, the global economic importance of the euro zone will halve in five decades. That is why geographic diversification, a process that is taking place gradually, is essential for the sustained growth of Spanish exports. Compared with its european partners, exports of high technological value still have lower relative weight in total Spanish exports. The high dependence on foreign energy imports (nearly 100% of oil and gas) reduces competitiveness in the Spanish sector. In 2011, around 86% of the foreign sector deficit corresponded to the energy deficit. far from being solved, between January and September 2012 the energy deficit increased by 13.6% year-on-year. The commitment to renewable energy that Spain has undertaken in recent years has helped alleviate some of this high dependence. The positive evolution of Spanish foreign trade in recent years has allowed a rapid reduction of major imbalances in the Spanish economy: the current account deficit, which has gone from 10% of GDP in 2007 to 3.2% in 2011, and it is expected to turn into a small surplus in the coming months (in the first nine months of 2012 the trade deficit has decreased by 25.1%, standing at 26,564 million euros). In 2011, Spanish exports rose by 15.4% and from January to September 2012 exports have continued to perform well, growing by 3.7% year-on-year, reaching 164,027 million euros. This has contributed to the significant improvement of the coverage ratio (exports/imports ratio), which in 2007 stood at 64% and currently stands at 86.1%, a record in the past 20 years. The trade balance with the eU reached in the first nine months of 2012 a surplus of 8,107.8 million euros, more than double the figure for the 2011 January-September period (3,174.1 million euros). Also with the euro area, a significant increase was recorded in the surplus, going from 1,258 million euros in January-September 2011 to 5,281,000 euros in the same period in 2012. According to UNCTAD, in the last decade Spain has lost only 0.2 percent of world export share of goods and services, well below the loss suffered by countries like UK, france, Italy and the US, which have suffered more at the hands of the emergence of china and other emerging markets in world trade. Data for 2011 and 2012 shows a clear trend towards the geographical diversification of Spanish exports to third markets, noting in 2011, growth in regions like the Middle east (+22.3%), Asia (+20.9%) or Latin America (+20.2%). From these weaknesses and strengths, intrinsic to the foreign sector, companies face a cast of external threats and opportunities presented by the global economy. Among the main threats, the following should be pointed out. As mentioned above, the eU is the main export market for Spanish companies. The global recession has been especially harsh in this region and the latest forecasts from the european commission (november 2012) are not particularly gratifying: the euro area GDP will decrease by -0.4% in 2012 and grow by 0.1% in the following year. The restriction of credit and the high cost of finance that Spanish companies face is a major obstacle in their internationalisation processes. The adjustment of the Spanish banking sector has greatly affected the business sector since, according to the High council of the chamber of commerce of Spain, 80% of Spanish companies resort to banks to finance themselves, compared with 65% in the rest of europe and 30% in the US. The emergence of new actors on the world scene, with a production model based on cost competitiveness, and the consequences of the global crisis on demand, mean that competition has increased significantly in recent years. Global economic power is shifting and will do so even more in the coming years. According to an OecD study, in 2030, 51% of global GDP will come from non-OecD countries and this is forecast to increase to 57% by 2060, almost doubling the current figure. These countries are of interest to companies not only for the size of their markets but for their growing middle class with increasing purchasing power. In recent months we can see a gain in competitiveness through various macroeconomic indicators: firstly, a depreciation of the real effective exchange rate (the so-called competitiveness indices trend) and a fall in unit labour costs, linked to salary adjustments and productivity gains (although this, in part, has been associated with loss of jobs). One of the keys to understanding this process is that the ULcs of larger exporting companies evolved more favourably than ULcs of smaller companies, to which the degree of concentration of Spanish exports must be added: a third of the total is concentrated in just 50 companies. Spain is in the top ten source countries of direct investment, due to the important internalisation process undertaken in recent years, which demonstrates its proven ability to successfully compete in international markets. The existence of the Leading Brands of Spain Forum is proof of that. This process highlights the weight of Spanish multinationals, whose drag effect on other companies is very significant. Having described the context of the external sector in which the company operates, we can move on to the analysis of the key factors in the internationalisation process. The first thing to note is the two- way relationship between competitiveness and internationalisation. Indeed, competitiveness is a necessary condition for internationalisation, and in turn, every company with sustained global presence is a clear driver of competitiveness, both nationally and internationally. But competitiveness through price is no longer the only effective strategy in international markets. It is necessary to have a differentiation that results in a reduction of the price elasticity of exports. This advantageous positioning is achieved through the so-called International competitiveness factors, which include: financial structuring, tax planning, R&D, quality, design, branding, communication, economic intelligence, logistics, human resources and strategic alliances. An adequate funding structure using the different tools available – equity, external financing both public and private, subventions and public grants, venture capital, business angels, multilateral financing, etc. – is an essential element 2. International tax planning of competitiveness and business access to third markets. funding should be commensurate to the size of the company, its structure and the stage of the business process, also considering the nature of the projects and the countries in which it operates. Establishing strategic tax targets is key and fundamental to any internationalisation process. Proper planning through a comprehensive analysis of factors such as proper tax structure, local tax planning, repatriation of income or proper funding, can result in a significant reduction in effective tax rate. The terms research and development are generally well known, and encompass three activities: basic research, applied research and experimental development. Meanwhile, innovation includes the introduction of new goods or services (product innovation) or processes which are technologically new or substantial technological improvement of existing products and processes (process innovation). As stated above, high technological products have lower price elasticity, which is a significant competitive advantage. or company. Therefore, any company wishing to be competitive abroad must act with proven quality, both of the product/ service and the business management, so that the choice of the appropriate approval/certification of quality becomes an interesting marketing tool. A well-designed product has a greater impact on the end user so that they are willing to pay less attention to the price factor, – the price elasticity concept comes into play again- and more consideration is given to other factors such as functionality, image, aesthetics or the symbolic character. It is worth emphasising that the competitiveness of the product or service is guaranteed when it fully adapts to the demand preferences of the target market. In a foreign market where the product is unknown, the key lies in differentiating the brand from that of the competitors. It is about creating a psychological image based on insights that add value to the product or service, clearly influencing the purchasing decisions of consumers. An important factor to consider when positioning the brand internationally is the trade-off between global brand and local brand, deciding whether the global brand adapts based on the requirements and characteristics of the local market. According to Interbrand, only two Spanish brands are among the Best Global Brands 2012, an index comprising the top 100 global brands. The recognition of the strategic value of communication to penetrate and a gain a foothold in a market makes this factor one of the most important for the company. The correct use of tools such as advertising, direct marketing, public relations, trade shows, the relationship with the media or websites, is essential to infiltrate new markets, becoming a competitive advantage for companies. and distribution of information, which is exploited to accommodate the needs of the company to a changing competitive environment. It allows the company to anticipate decisions of competitors, reduce risk, and to be permanently informed and innovative when making key decisions. In addition to price or product quality, customers are increasingly assessing, in the selection of suppliers, issues such as delivery reliability, flexibility and responsiveness. Thus, a good management of all logistics processes becomes a very important differentiator in the international arena. There is a high degree of correlation between the level of training of employees and managers and the pervasiveness of companies in international markets. Therefore, international training becomes a key factor for competitiveness, constituting talent management and human resources the centrepiece of the process. One of the key factors for the success of the international process is the correct definition of the most efficient organisational structure for the company among different possibilities such as local staff, executives who travel from head offices and expatriation. The Spanish company must use the many advantages of strategic alliances to improve competitiveness and access third markets. Some of these benefits are, in addition to facilitating the entry into new markets, reducing costs and risks associated with the implementation of major projects and the acquisition of know-how, R&D and possible new sources of finance. One thing to note is that, since Spain is an interesting hub with Latin America and north African countries, there are already several strategic alliances in different sectors, some with Asian companies interested in these markets. In order to effectively utilise the opportunities presented by the external sector, it is essential for companies to be competitive in all stages of internationalisation. Any internationalisation process – regardless of the fact that a company can be in several stages at once in different markets or that it does not follow the process in a linear fashion – has four distinct stages: exportation, joint venture, direct investment and multinational. The international competitiveness factors listed above are present in all stages of internationalisation and in each stage there are critical decisions that should not be ignored. Decisions such as the choice of market or target markets, distribution channels, financing structure, partner selection, tax planning, structuring partnerships or redesigning the organisational model are fundamental decisions that will have an impact on the reduction of risks and costs associated with the internationalisation process and the odds of varying international project success. The external sector has become the driving force of the Spanish economy and will allow us to overcome the current difficult situation. However, unlike other eras in Spanish economic history, which also saw the country’s external accounts help to overcome the crises, beginning with currency devaluation, currently the focus of competitiveness is linked with efforts such as structural reforms being carried out and which resulted in improved productivity, and therefore unit labour costs (although this is also due to reduced employment levels), as well as a depreciation of the effective exchange rate in real terms. 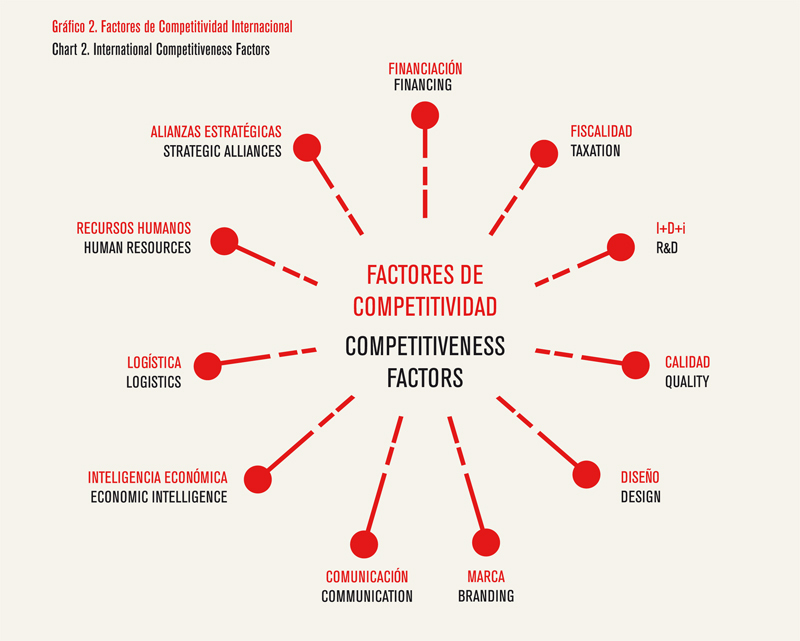 From a microeconomic perspective, the company must also keep in mind that competitiveness depends not only on price but on other factors, including financial structuring, tax planning, R&D, quality, design , branding, communication, competitive intelligence, logistics, human resources and strategic alliances. In addition, to undertake a successful internationalisation process, it must be appreciated that there are different stages (export, joint venture, direct investment and multinational presence) and in each stage there are key decisions that must be taken carefully. Indeed, a poor choice of market or partner, poor financial or tax planning or not paying enough attention to local law, may bring a failure of the internationalisation process, so the company should take advantage of existing public instruments and specialised business consultancies with presence in the target markets, so that the process is successful and sustainable over time. ANTONIO HERNÁNDEZ GARCÍA. Partner of Regulated Sectors, Foreign Investment and Internationalisation of KPMG in Spain.